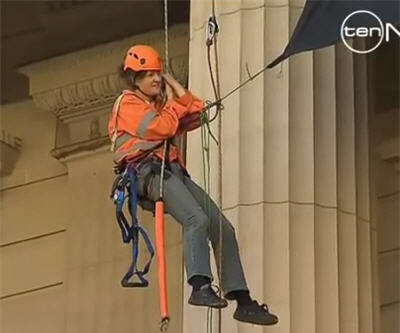 A group of protestors from anti-coal group Quit Coal have staged a dramatic protest in the Australian city of Melbourne today, abseiling down the front of the state parliament building and chaining themselves to its pillars. According to ABC News the nine activists are protesting the state government's support for brown coal projects, with Quit Coal spokeswoman Madeline Egan saying there is widespread public opposition to coal mining in Victoria. "If Premier Baillieu would withdraw the $45 million that he's allocated for experimental coal projects we would happily come down," said Egan. The Baillieu government first unveiled plans to develop Victoria's brown coal reserves earlier this year, confirming the extension of new coal allocations for industry. The plans were immediately met with opposition from local community groups due to the brown coal-fired power industry's high carbon emissions and adverse environmental impact. Victoria's energy minister Michael O'Brien has branded the protesters foolish and ill-informed, and said "this is a group that's got a completely unreal view of the world."